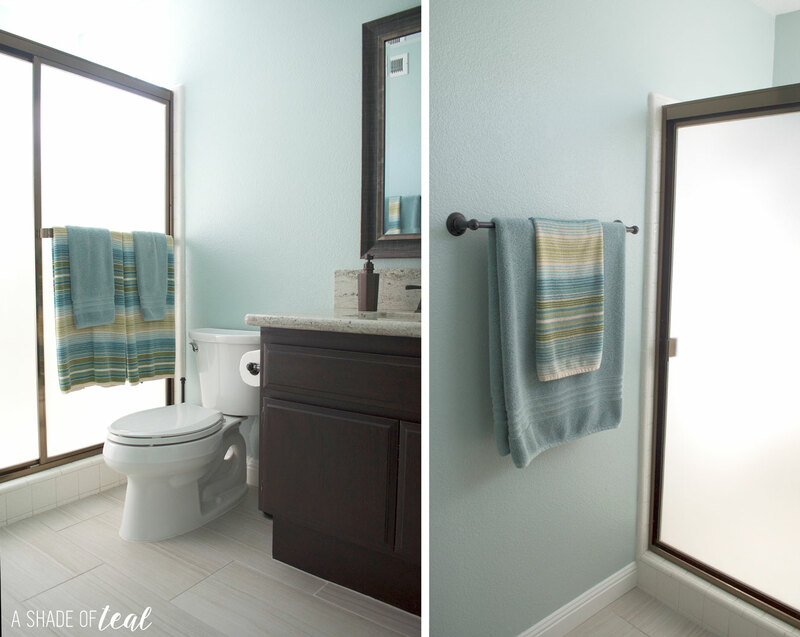 I’m so excited to share my Quick & Easy Rustic Bathroom Refresh with you! 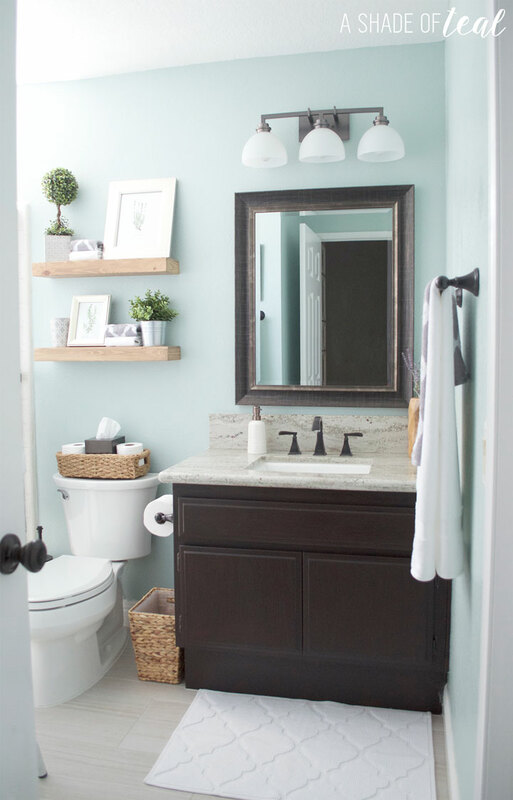 My downstairs guest bathroom has been on my list of to-do’s forever. I already reworked the room after we purchased our home by installing new tile floor, paint, a new granite counter top, stained cabinet, bronze fixtures, mirror, and light fixture. But when it came to adding those finishing details I’ve been putting it off. With back to school upon us, I always get a boost of energy to start those unfinished projects along with getting organized. It’s really hard to pass up the back to school section at Target, even though I’m not in school! I love shopping the new stationary, dorm accessories, and even the toiletries. You can always find really good deals! 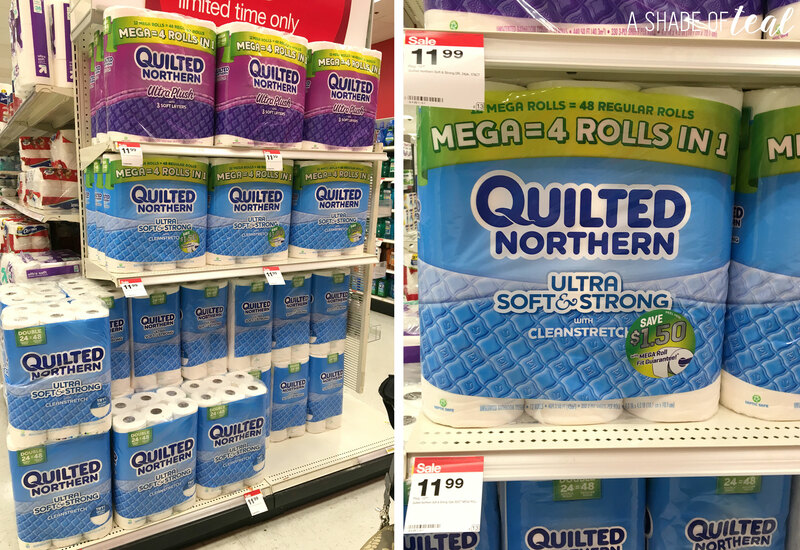 While picking up Quilted Northern® I was finally determined to decorate my small bath. If you’re sending someone off to college you’ll want to give them the Quilted Northern Ultra Soft & Strong® Mega Rolls. I personally love purchasing them since they have 4x more sheets and you can forget refilling the roll for longer periods of time. It’s the worst when you have company over and run out of toilet paper. You can find them on the end cap at Target in the toilet paper aisle. I also found almost all my decor items at Target. Before decorating my bathroom I knew I wanted to make the room feel fresh with a little rustic flair. 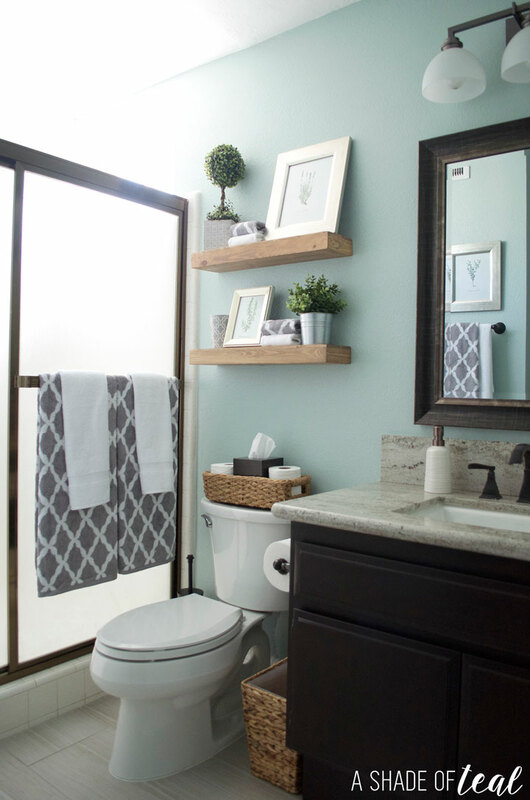 Since this bathroom only has 1 small window and a dark cabinet I decide to mix in all light neutrals with white and grey towels, natural wood, and some greenery. Here’s the before pictures of my downstairs guest bath. Neutral Linens. White does scare me with little kids, but it’s probably one of the easiest colors to maintain when washing. Faux Greenery. I’m in love with faux Boxwood’s right now; any shape or size they add that perfect touch of rustic style. Texture. By adding a natural or distressed wood rather than solid white or black, you get that touch of rustic without going overboard. I also like to add natural baskets in the same color. Artwork. When it comes to art I love finding free printables online or even creating my own. You can easily print them out from home and change them up at any time. Metals. Don’t be afraid to mix metal finishes. Most of my fixtures are bronze but by adding silver frames and plant pots it gives the room more interest. If I left everything bronze it would feel too dark and heavy, hence before pics! Clutter. I prefer to keep my counters free from clutter. It help makes the room feel larger and more inviting. Now for the after pics! Also enter the sweepstakes below. 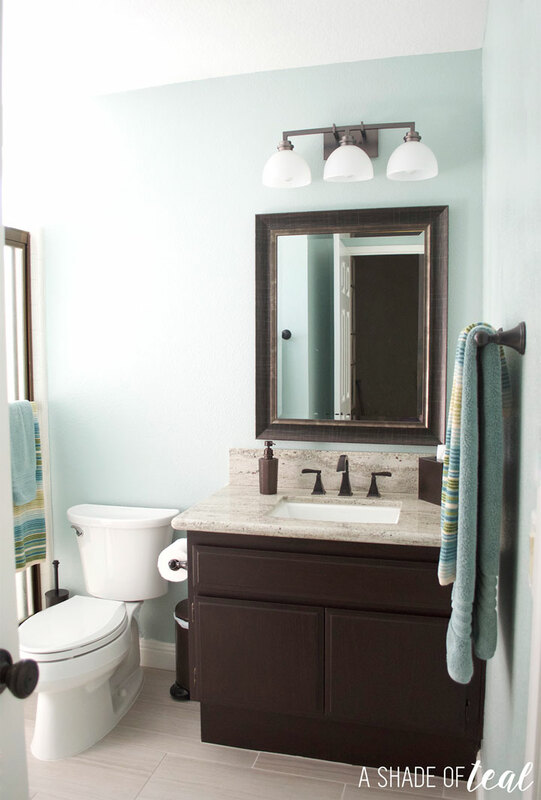 Do you have any tips on getting that quick and easy bathroom refresh? I would love to hear. My bathroom definitely needs a refresh! I love, love, love that rustic look. That is a really clean and cute bathroom. I love how organized it is. I like the color of your bathroom to begin with. 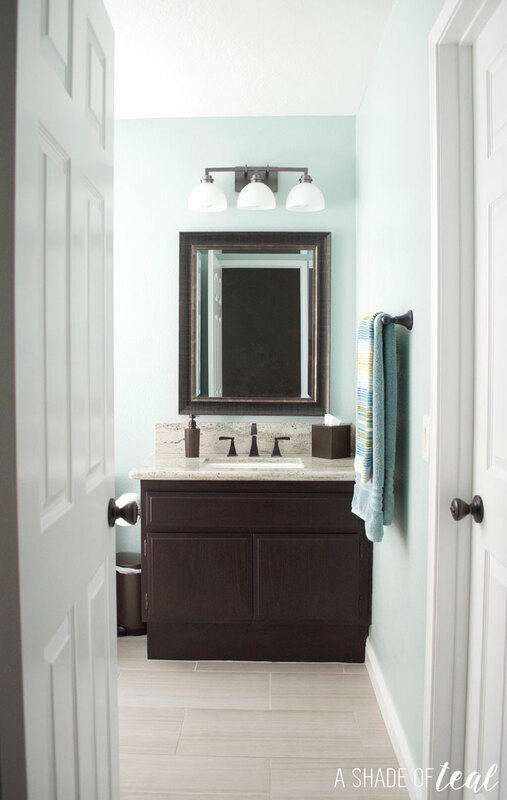 The brown and blue mixes so well, it’s easy to add items that will complement it. I love the new look, it has more life! Too much beauty in just one post! 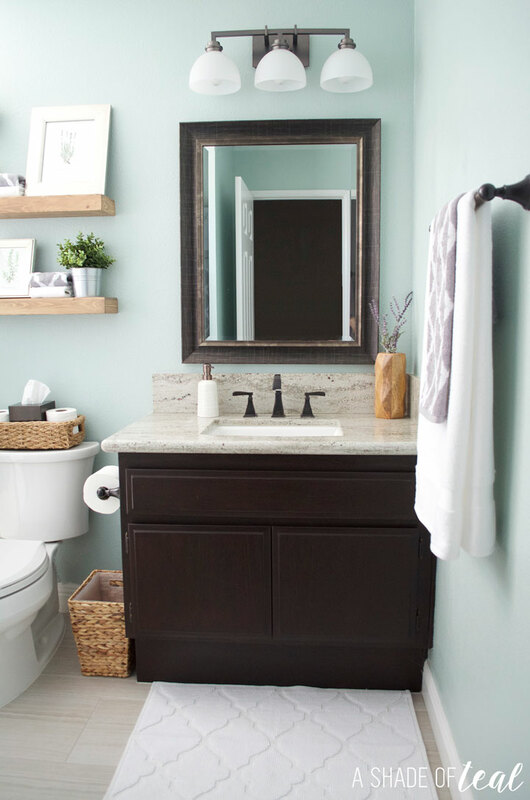 Well, a bathroom’s a bathroom but I still wish I had one like this, those 6 rustic tips are sure to come in handy on my next redecoration day! What a gorgeous bathroom. Ours desperately needs a refresh. Oh I am in LOVE with your bathroom!! I would love to do something similar to my bathroom. You have such a beautiful bathroom. Love the decor, color and design. Great giveaway by the way! I am loving the rustic look of this bathroom. We just moved and I have been looking for styling tips. i love the look of your bthroom. 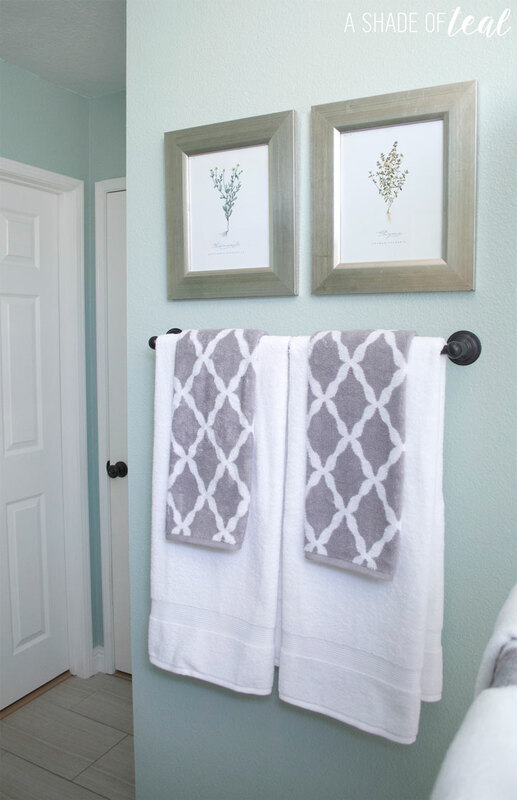 this is so refreshing and i am going to steal some ideas lol for my bathroom. Beautiful bathroom. I am in love with the paint color. Do you know what it is? It’s look beautiful and this is so refreshing. This is an awesome work skill that is done by you. I would love to do something similar to my bathroom. Thanks for your informative article. What is the name of the colour of the paint on the walls?